What do dust mites do? 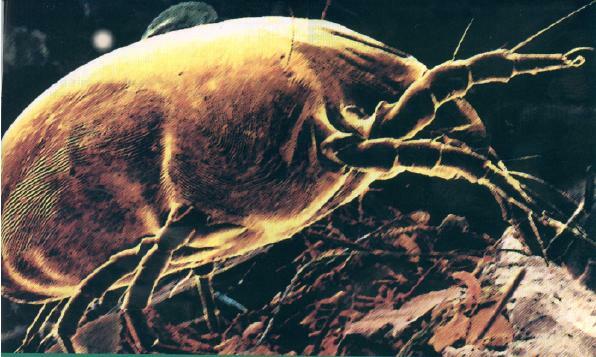 Dust mites feed off shed human skin cells and are most often found around the home in carpets and mattresses. The reason why dust mites cause allergies is because humans react to a certain protein which can be found in the droppings of dust mites. More comprehensive information on dust mites can be found here. Don’t let this ruin your night’s sleep! These little critters can cause a lot of trouble! How Can We Help Eliminate Dust Mites? We offer a unique Chem-Dry dust mite treatment service in your home which neutralizes the dust mite faeces and gives relief to people who suffer from dust mite allergies. Chem-Dry QuickDry treats carpets, lounges, manchester and mattresses for maximum relief. With over 18 years experience in the industry, Chem-Dry QuickDry aim to provide Sydney residents with the best possible experience each and every time and always offer affordable rates. We come out at a time that will suit you as we don’t expect our customers to be inconvenienced by our services. All our products and equipment are of the highest quality and there is no job our experienced and professional team can’t handle. We often find that once a customer uses Chem-Dry QuickDry, they are so satisfied with our services that they will never look to use another carpet cleaning service provider again. For a wonderful night’s sleep, call our team today and get a free quote on one or more of our services. Alternatively, fill out our booking form and one of our Chem-Dry specialists will contact you as soon as possible. For a Drier, Cleaner, Healthier night’s sleep, call the Chem-Dry dust mite treatment experts today! You’ll be able to see for yourself why we were voted franchisee of the year for 2010 and that we will provide you with superior services and results! Professional Rug Cleaning & Protection. Tile and Grout Cleaners, Sealing. Water Damage Restoration. Smoke Damage Restoration. Aeris Air Conditioning Treatment. Mattress Cleaning and Sanitisation. Carpet Cleaning & Protection. Pet Odour Removal.